Mumbai, Feb. 17, 2017: Golden State Warriors’ superstar, and one of the NBA’s biggest global ambassadors, Kevin Durant will be visiting India in the 2017 off-season. Durant currently in New Orleans for the 2017 All-Star Weekend where he will make his eighth successive appearance at the 66th NBA All-Star Game on February 19 (February 20 IST). The NBA superstar had encouraging words for the 24 players selected to the NBA Academy India. “I think it is just the fundamentals of dribbling, shooting, passing that you know and that crossovers no matter where you are as a basketball player. 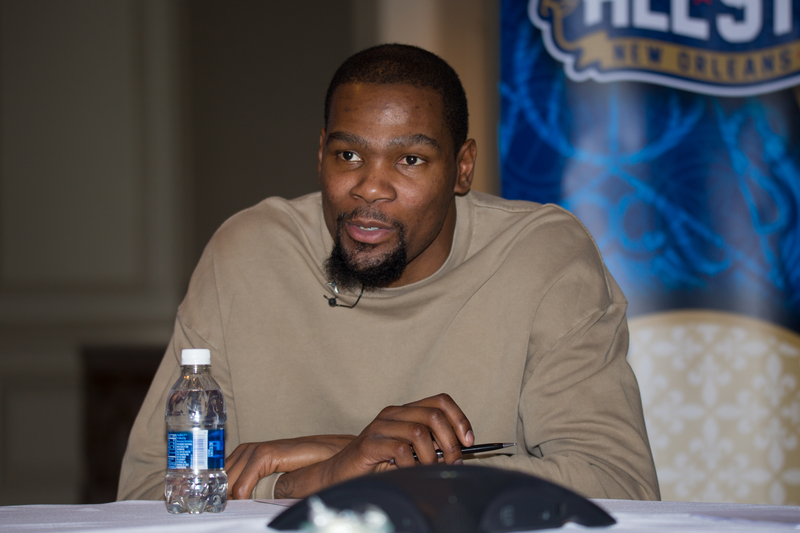 So when you get those fundamentals of the game right, that’s where you start at,” Durant said. Durant signed with the Golden State Warriors as a free agent in the 2016 offseason after playing nine seasons with the Seattle Supersonics/Oklahoma City Thunder. As a member of that franchise, Durant was named the 2007-08 Rookie of the Year, clinched four scoring titles, made it to six All-NBA teams, joined the 50-40-90 club in 2012-2013 and was named league MVP for the 2013-14 season. Playing with the Warriors in the current NBA season, Durant is averaging 25.8 points, 8.3 rebounds and 4.9 assists through 56 games. He is recording career-highs in field goal shooting percentage (53.9%), rebounds (8.3 rpg) and blocks (1.7 bpg). Durant’s season-high 40 points also came against his former team, the Thunder, in a 121-100 blowout win at the Oracle Arena on Jan. 18. With Durant in such fine form, the Warriors are sitting pretty with a league-best 47-9 regular season record at the All-Star break. Durant also admitted to wanting to visit the Taj Mahal. “Seeing the Taj Mahal has been on my bucket list for a while,” the All-Star player said. NBA fans in India would surely be excited by Durant’s confession and the opportunity to see the superstar in the country.